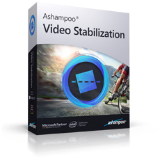 iVoicesoft Giveaway offer Ashampoo Video Stabilization 1.0.0 for free download. Ashampoo Video Stabilization 1.0.0 may be only available to FREE download in published day, 15 Apr 2019. Next day, we will offer new Giveaway. Check it now!